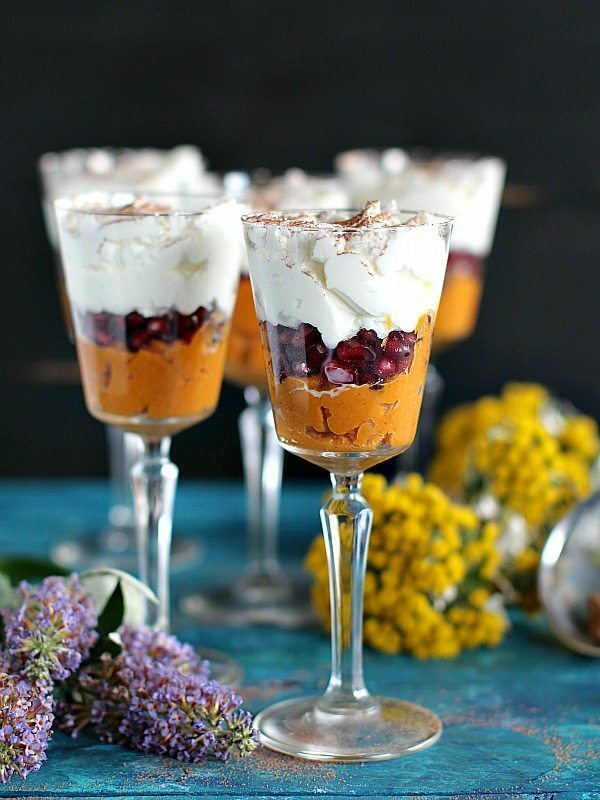 Healthy Roasted Butternut Squash Trifle is light and creamy while still on the healthy side. The Trifle is gluten free and loaded with beautiful flavors and textures. We love making Trifles because they are the most easy and yet stunning desserts. 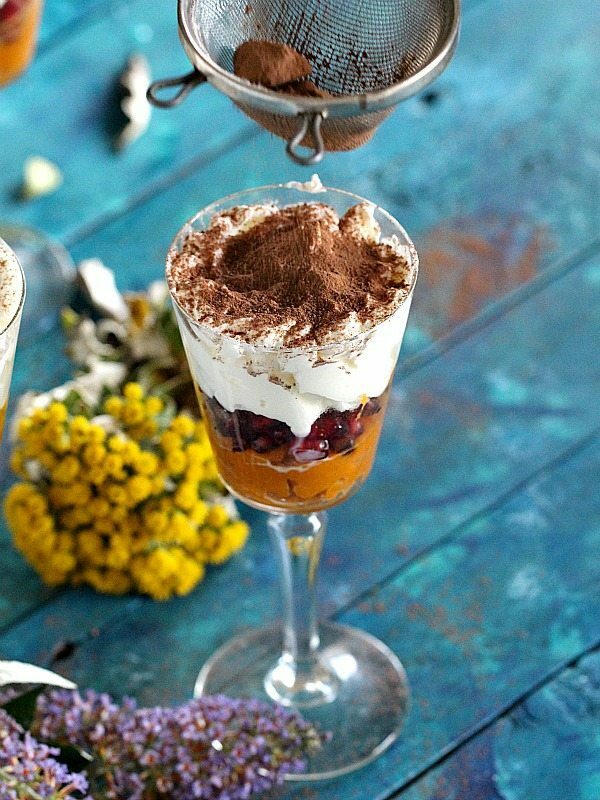 I have quiet a few on the blog for you to enjoy, like delicious Brownie Trifle Pudding, Coconut Tiramisu Trifles and Butterscotch Banana Trifle. This Roasted Butternut Squash Trifle is the type of dessert I like to have on a weeknight, because its sweet, delicious, yet not heavy. 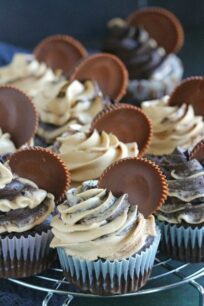 Also, with Valentine’s Day approaching, this would be such a perfect dessert to serve or to share with your sweetheart. In addition, its easy to make and looks just stunning. 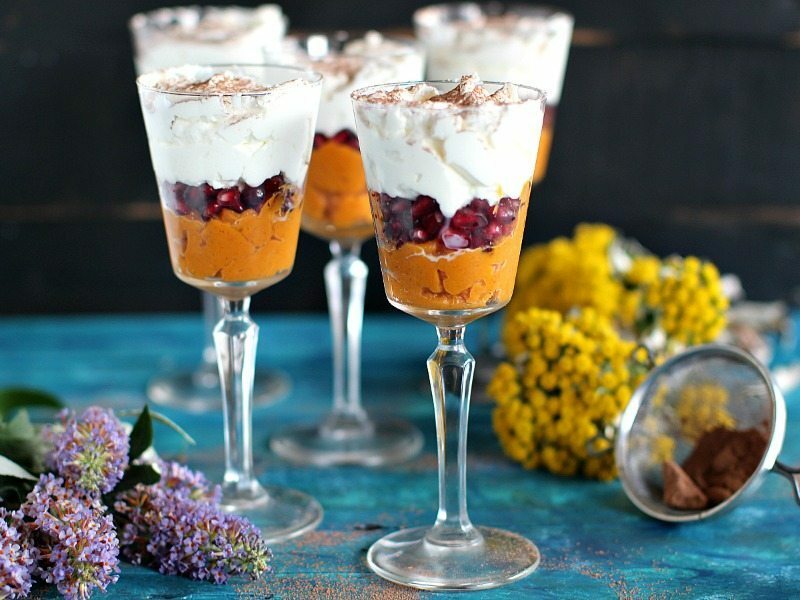 This Roasted Butternut Squash Trifle is very easy to make. It has sweet notes of cinnamon and brown sugar. The squash is roasted to perfection, pureed and topped with crunchy and juicy pomegranate arils. A cloud of sweet and fluffy whipped cream is added on top for a creamy and indulgent finish. A little unsweetened dark cocoa powder adds the perfect bitter contrast and finish to this stunning dessert. They are rich and refreshing, and would be a show stopper dessert. Also, easy to find ingredients and minimum prep work is needed. In addition, perfect for Valentine’s Day occasion. Once you cover the brownies with whipped cream, cover the dish with cling film and leave to set in the fridge for about two hours. It is best for trifle to settle for few hours before serving. Place butternut squash halves on a large baking sheet with the flesh side up. Drizzle with coconut oil and sprinkle brown sugar and cinnamon equally over each squash. Roast 50 to 60 minutes, until flesh is fork-tender. Let the squash cool; remove the skin and using a fork puree it. 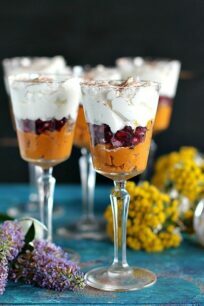 Layer the pureed butternut squash equally in 5 trifle glasses (any medium size glass) as the first bottom layer. Top with pomegranate arils. Using a mixer, combine the heavy whipping cream and sugar, and whisk until stiff peaks form. Distribute equally over the trifle as the last layer. 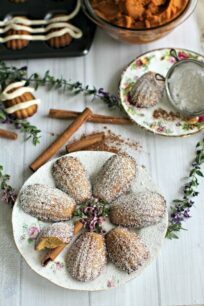 Garnish with cocoa powder. Oh my goodness, Katalina! These are gorgeous, and I love that they are healthy, too! What beautiful looking trifles! Great photos, as always!